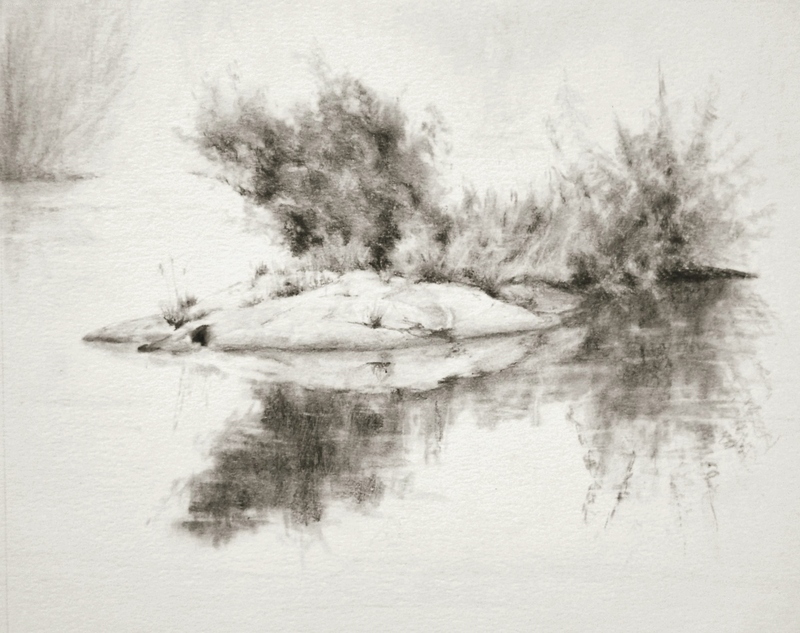 Lake Reflections, a graphite drawing (8×10) was drawn on Strathmore Bristol Vellum paper using a minimalist approach. Graphite pencils used were 2H, HB, B, 3B, 6B, and for blending tools a tortilium, pad and kneaded eraser. The scene could have been drawn illustrating the lake as a full body of water using highlighted lines to symbolize water movement, but instead I went for a minimalist approach hoping that the reflections of the foreground subjects provided the vision I was after. Thanks for checking in – click onto the image for a larger view. This entry was posted in Drawings and tagged art, drawing, fine art, graphite, lake, reflections, rock, weeds. Bookmark the permalink. A wonderful surprise Violet, how nice to see you again. Hope you are well, I will have to go see what you’ve been up too. Thank you for your lovely comments – you made my day! Mary, what is amazing is that you are able to work in so much detail into a canvas that small, without the ability to zoom in! Truly brilliant! Thanks so much Madhu. I tried to keep the drawing simple in nature, but provide just enough detail for the scene to make sense to the viewer. Appreciate your generous thoughts. Amazing ! 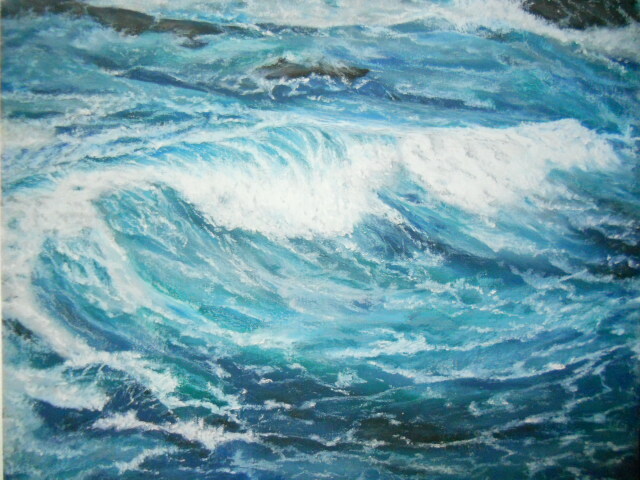 In awe of your beautiful works.! Thank you so much Poppy – loved your description, it’s the reaction that I had hoped when one views this drawing. Mary your artwork always amazes me with its perfection. Beautiful work! Thank you for your thoughts, always appreciated! Such as lovely drawing, Mary. You seem to have magically used the very texture of the paper to suggest gently rippling water. And yes, reflections such as those you’ve so deftly rendered do indeed call forth those reflections on life I’m sure we’ve all enjoyed whilst quietly waterside wandering. I’ve found my own such wanderings restore a sense of perspective and order with sometimes a poem resulting. Thank you so much Paul for such thoughtful and inspiring feedback on this drawing. Graphite is allowing me to illustrate the softness of a scene and yet yield to the strength of the reflection. Really appreciate that the drawing can provide such a feeling or vision for you, thank you for the compliment. Yes, your writing provides the same reflective/perspective and lets the reader envision the path your words set forth. Thanks so much for visiting again. This piece is so beautiful Mary, I love the peacefulness that it evokes. Thank you so much Heather. This was the perfect scene to capture with graphite, it gave a wonderful overall soft atmosphere throughout. Thank you Rita, it was a great little scene to illustrate a “quiet” place. That is perfect! So very lifelike. The rock and reeds sticking out of it. The reflection all perfect! Thank you so much Elizabeth for your thoughtful feedback on the drawing ~ hope you have a lovely weekend. I cannot begin to imagine the challenge of drawing a reflection. But you make it sound and look easy here, Mary — brava! Thanks so much Jet, means a lot. Reflections always tell a story, in this case it helped create the mood of the scene – so happy you enjoyed this one! Great response Silver – love it. Thanks so much for enjoying the drawing! Quietly stated and very much as the scene itself was to imply. Thank you Prospero – hope you have a lovely day. Thank you Pauline, really appreciated. Thank you my friend, much appreciated. So gentle! It really is lovely, Mary 🙂 Hope you enjoyed your Easter break. Thank you so much Jo – “gentle” a real nice descriptive! Totally enjoyed the break and getting right back at it. Hope you have a great weekend! You got what you were after Mary! The drawing is lovely and the reflections make for instant recognition of a peacefully still lake. Hi Dorann, thanks my friend for your special thoughts. Scenes like this always bring me a sense of peace, so thank you for mentioning. i always enjoy taking a closer look at your drawings in order to see the wonderful detail. Thanks Frank, you know I always appreciate your view of my work – means a lot to have you stop by. Are you back on the golf course yet? Oh wow this is good news. Congratulations to your wife, I’m sure she is thrilled not being ruled by an alarm clock. And Frank, way cool that you are actually out there hitting the ball again, but the best is that you’re working at a course. No telling how many times you’ll be sneaking in a game or two. Hopefully the weather cooperates this year and you see a lot of tee-times! I inquired more while at work yesterday. Much depends on availability (very understandable) … but the good news is that my wife and I can play with a cart for free!!! Woo hoo!!!! Now that is a real deal sweetener, very cool Frank!! Here is too many games and happy times this summer. I look and see ‘Mary, graphite, water’…. and then speedily click to your site! You’ve definitely got a thing going on with these – I just LOVE how you handle them, and create wonderfully evocative work! Thanks very much Debi. I’m having a good time exploring how to develop believable water with graphite and charcoal – those two mediums are perfect for creating fluidity within a scene. Thanks again for your supportive feedback! you’re welcome!! I love what and How, you do it!! awesome. hey, quick question….. what is the polldaddy rating . com ? Hi Debi, thanks again. I wish I could tell you what polldaddy is. One day it popped up on my blog and I can’t get rid of it. It shows on my end as well. One of these days I’ll have to get with WordPress to see if they can’t help get rid of polldaddy. This is beautiful Mary. I can see and feel the peacefulness. Thank you Nicodemas – a feeling of peace is what was meant for the scene. Thanks very much Sylvia for your generous thoughts on this drawing – loved how the scene came alive for you. Cool read Sylvia! Thank you Maniparna – wonderful compliment. Peace is a good way to describe these scenes. Oh Mary, I’d love to see this in real life! It looks like a masterpiece. Your visions with charcoal & graphite are alive! Wonderful drawing, Mary. I like the minimalist approach you used. It really drew my eyes into the middle of the painting to absorb the details and the reflection. I hope all is well with you! Thanks so much Janell. This approach really did work and left the viewer to fill in the details of the scene. I’m great – we have a few house projects these days so I’m splitting my time and so far it’s working. Hope I haven’t missed any of your latest posts, but I’ll go out and check later this evening. Hope you are doing well too!! Thank you so much Janet for always being present and encouraging!! Thank you Derrick for your generous feedback! Thinking about you guys today as we have bad storms coming for us starting soon (when they forecast a “few” tornado’s, well we’ll be rock n’ rolling in TX). Hope the garden clean up is going well and not too disheartening. Good to hear, my best to you and Jackie! I love the reflection, Mary. Beautiful work! Thank you Jill – the reflection was really cool to maneuver with my tools. Have a great day! Thanks so much Amy – loved reading your reaction to the scene, means a lot! A calming and reflective scene Mary. Wonderful. Thank you Susan! It was a great scene to work out in graphite. You do work wonders with graphite. I see color when it can’t possibly be there. An amazing compliment my friend – thank you, it is appreciated more than you know. This one is again as awesome as the last. The rock is so beautifully depicted. Your foliage is beautiful. And the reflections portray serenity. Well done!!! Thanks so much Rhonda, really appreciate it! I loved working the rock in this scene – a nice big slab of rock that had very little markings on it, but enough to give it some form. Glad you enjoyed the scene. Are you becoming a mystic, Mary? Lately, your drawings are infused with light, and very mystical. Your choice of treatment for the water is brilliant! The reflections really do all of the suggestive work. Just wonderful, my friend!